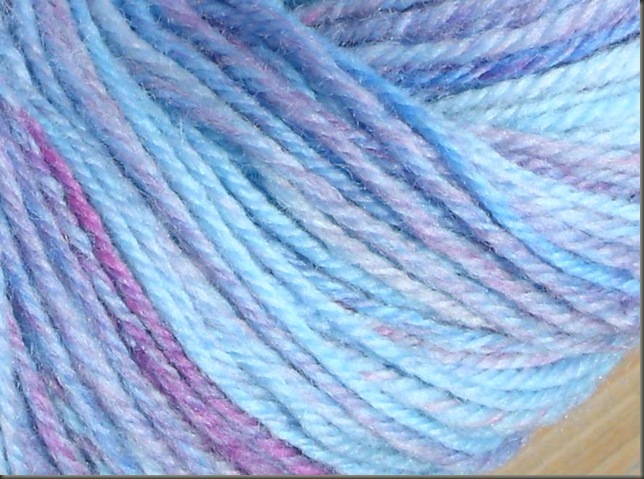 My dyeing technique was rather haphazard that day, but as usual, the finished yarn has a mind of it's own :) I must have been channelling the local dairy bar because it looks almost exactly like bubblegum ice cream! After spinning the top randomly (torn into pieces and just randomly strung together) I decided to navajo ply to conserve the gentle stripes. The finished yarn is 14-16 WPI (actually really even! I impressed myself a little) I was really surprised at the way the pinks and blues melded together too - Barberpoles, purple shades, all over gentle mixing. The resulting colour is predominantly a robin-eggy blue with a mix of purples, lavenders, almost fuschia in some segments. Because of the random colour placement, there are some stripes that are meters long, and others that are just short snippits. 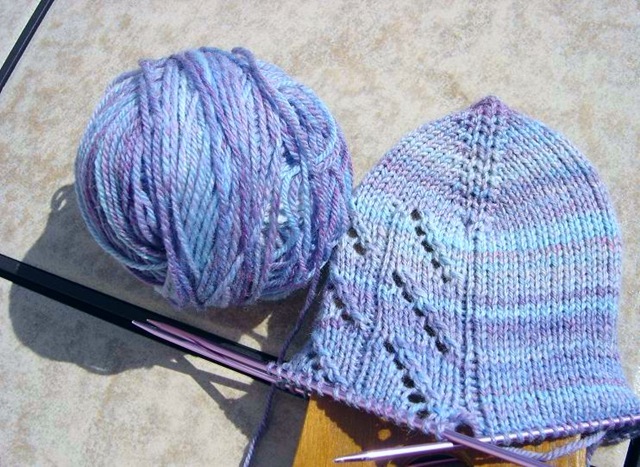 I tried to be choosy with where my chain "joins" were so as to minimize any abrupt colour changes in the yarn. From the 4 ounce braid I ended up with about 400 yards... so enough to make a decent sized pair of socks. 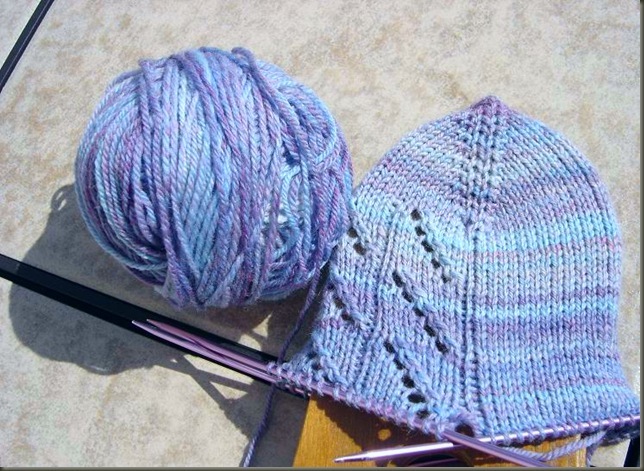 In a lot of ways this is the closest I've gotten to making something that is as thin and even as commercial sock yarn. Captain Corriedale... Part 2 - Spun, Washed, Skeined! So I finished my singles... plied and Voila! I think my extra twist paid off, because the resulting yarn plied quite nicely... giving more tightly wound yarn than I would normally get. Which of course is exactly what you want with sock yarn in the first place. Also, the long staples of the corriedale gave a nice smooth single, combined with the extra twist, resulting in a smooth strong strand. The original roving had very distinct locations of colour, so I was surprised at how much the colours muddied here. 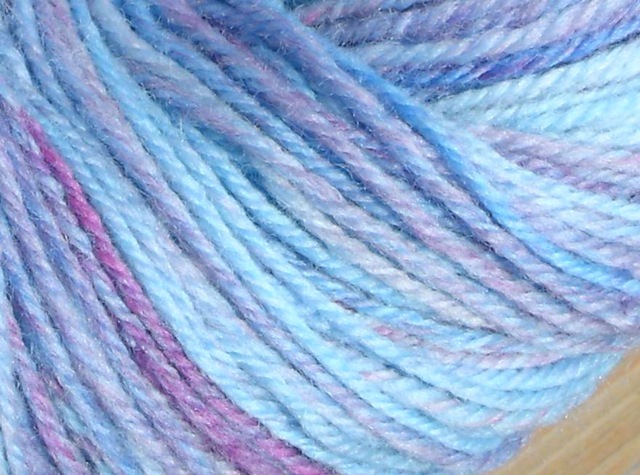 I suppose since it was 3-plied, the colours were able to spread out... giving longer gradations of shades, as opposed to discrete sections of colour. I will remember this as I continue dying roving to spin... adjacent colours tend to mix into each other. For example, Yellow next to blue gives some greenish tones. Note to self, Purple next to Yellow gives brownish greenish mud. While the resulting muted tones aren't completely undesirable, I found the beige-ey light brownish areas kindof boring. It would have been nice to keep the pretty purples and yellows distinct more.